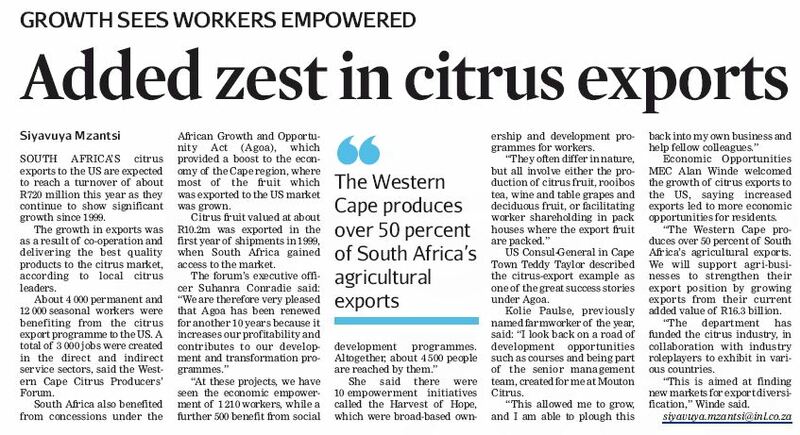 It’s been a very good season so far for the South African beneficiaries and farm workers on South African Government owned farms managed by Bono Farm Management. “We are very happy to have been able to pay considerable amounts to our beneficiaries – and contribute to their children’s schooling – thanks to efficient harvesting, proactive marketing”, said Bono MD Evans Nevondo. Beneficiaries at Mont Piquet farm received R30, 000 each in December 2015, and a further R30, 000 each in March 2016. At Rietkloof, farm beneficiaries each received R20, 000 in December 2015 and another R20, 000 in March this year. In addition R1, 000 school fees per beneficiary were paid out in January 2016. Mr Nevondo said that in addition to payments for beneficiaries 37 permanent workers (who are not beneficiaries) were also rewarded with bonus payments. On the Bono managed Sunland farm, beneficiaries were each paid R20,000 in April 2016. Over and above that, beneficiaries also received R1,000 in school fees each in January 2016. “I am very pleased that we have made these payments,” said Mr Nevondo.” It is important to us that the people who own the land see the benefits of their hard work. Mr Nevondo said the company anticipated making further payments to beneficiaries and farmworkers in the near future, contributing to the social and economic well-being of local communities. “The pay outs to date resulting from improved efficiencies, hard work and aggressive marketing of harvests is just the beginning of long-term sustainable successes we aim to achieve”, he said.